The entire roof of a two-story building was lifted into the sky with a single gust of wind in Siberia’s, Zabaykalsky Region. Stormy winds have been raging over the past week, causing massive devastation and deadly fires. 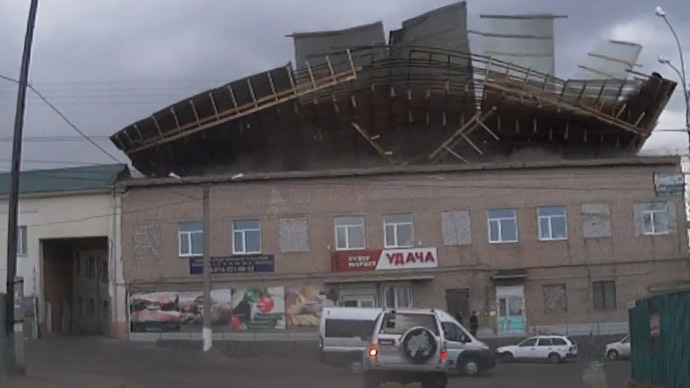 The flying roof episode was caught on the dashcam of a passing car in the city of Chita, in the southeast of Siberia. The gust was measured at 24 meters per second (54 miles per hour). Luckily, the building was uninhabited as it is used to house a taxicab fleet. No injuries or damage were reported, according to the press service of the local Emergency Ministry. The roofless building is now one of more than 1,300 houses destroyed in the region by fire or the elements. The devastating blazes, which have already claimed the lives of over 800 people, have now spread to neighboring Mongolia. An area of just over 100,000 hectares has been affected, despite around 3,000 fire fighters doing their best to try and tackle the blazes. They have used planes and helicopters to attempt to put out the fires and have managed to save five settlements. The firefighters have been trying to use a controlled burning technique, which deliberately burns out a certain part of the forest, to prevent the wildfires from advancing even further. Reports say that settlements in the region are not under any threat from the fires at present.